KSU activists burn effigies of Prime Minister Narendra Modi and Home Minister Rajnath Singh in Nongpoh. 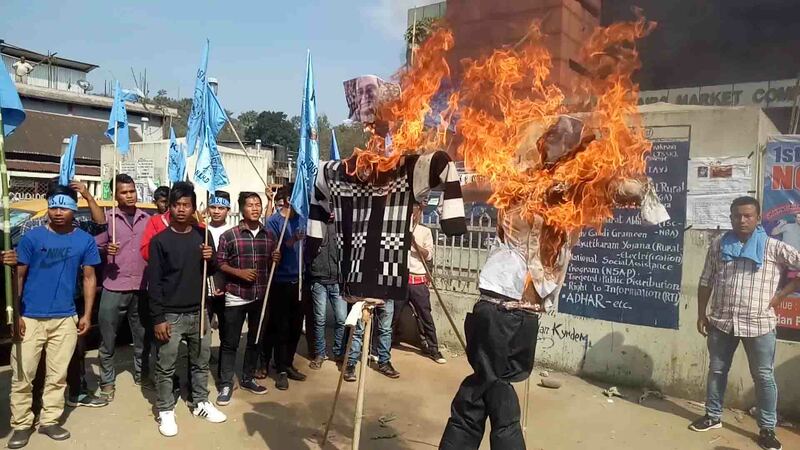 SHILLONG: The Khasi Students Union, North Khasi Hills district unit on Wednesday burnt the effigies of the Prime Minister Narendra Modi and Home Minister Rajnath Singh in protest against the Citizenship Amendment Bill. Sending a strong message to the Centre, the KSU leaders said the Union along with North East Students Organisation (NESO) and other NGOs in the North Eastern region will continue to protest and will not allow the act to be implemented in the state and the rest of the North East as it will have a severe impact on the tribals inhabiting the region. Meanwhile, the Joint Action Committee (JAC) of Unions, North Eastern Hills University (NEHU), held a protest rally on Wednesday against the Centre’s move to implement the Citizenship (Amendment) Bill. Earlier in the day, the unions also threatened to intensify their agitation if the bill is passed by the Rajya Sabha. The JAC also held a public rally which was attended by a large number of students to lend their voice of opposition to the CAB. However, by the end of the day the bill was on its way to a natural death as it was not tabled in the Rajya Sabha on Wednesday, the last day of the winter session. in the city on Wednesday. At the rally, NEHU students’ union advisor, Rangdajied Marwein, resented the BJP’s attempts to make the North East a dumping ground of immigrants and asked the Center to open its heart to the millions of Indians and stop infringement of the rights of tribals.